Houston, TX - Wednesday June 28, 2017: Carli Lloyd attempts to head the ball towards Boston's goal during a regular season National Women's Soccer League (NWSL) match between the Houston Dash and the Boston Breakers at BBVA Compass Stadium. EDINBURG — Edinburg native Ariana Vera has been a Houston Dash season ticket holder since the franchise’s inception in 2014. A longtime supporter of the United States women’s national team, Vera has followed the National Women’s Soccer League since it first started play in 2013 as a way to keep tabs on her favorite players. Vera’s schedule doesn’t allow her to get to each of the team’s 12 home matches — just the ones that fall on Fridays and Saturdays. She likes to make a weekend of it, visiting her sister who lives in the Houston area. 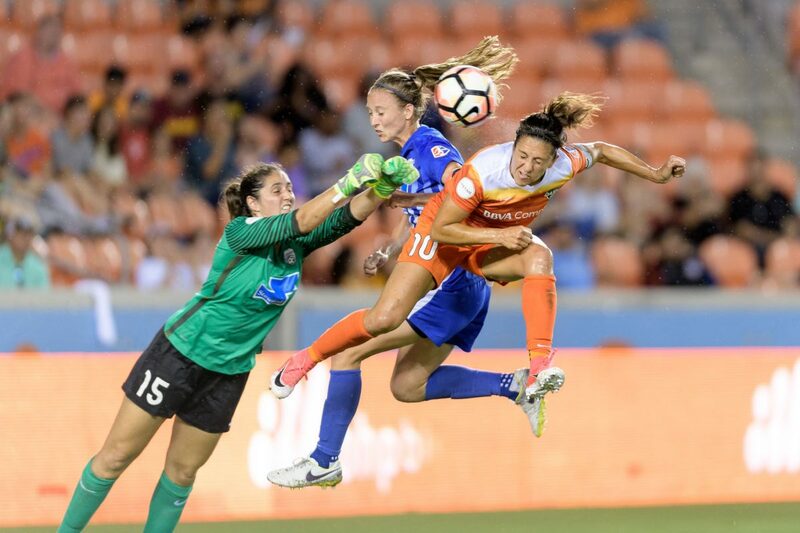 Next week, the Dash are returning the favor, making the trip down to Edinburg to host the North Carolina Courage at 7 p.m. Wednesday at H-E-B Park. The matchup was originally scheduled for Aug. 27 before being postponed and relocated due to Hurricane Harvey. As a result, the Valley will play host to an NWSL match for the first time, and the Dash will try their hand at recruiting new fans from an untapped market. 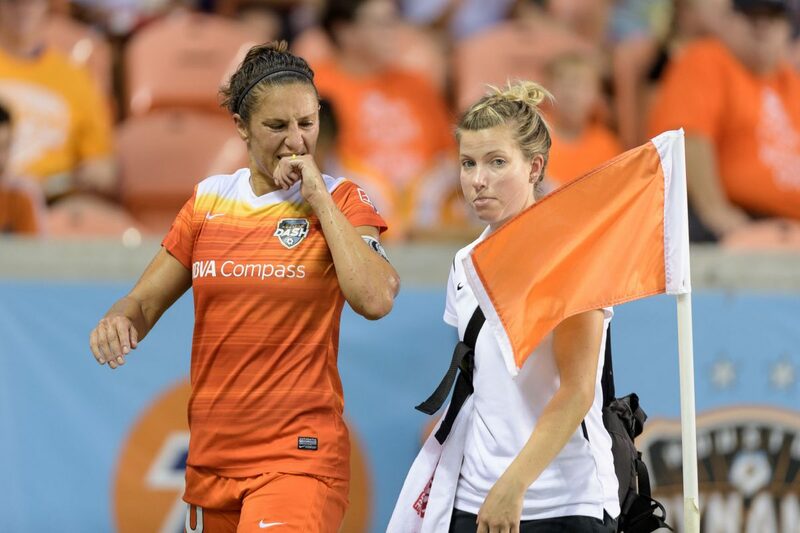 Houston, TX - Sunday August 13, 2017: Carli Lloyd grimaces after injuring a leg during a regular season National Women's Soccer League (NWSL) match between the Houston Dash and FC Kansas City at BBVA Compass Stadium. For Dynamo president of business operations Chris Canetti, the top priority was simply finding a place for the Dash to play. In addition to the Aug. 27 match against North Carolina, the Dash were forced to relocate their Sept. 3 home game against Seattle Reign FC, instead playing it in Frisco. In trying to find a new date and location for the match against North Carolina, Canetti said he also looked at Dallas and San Antonio before settling on Edinburg. The Dash are run by the Houston Dynamo organization, and the Dynamo have a hybrid affiliation with the RGV FC Toros, making H-E-B Park a natural fit. RGV FC president Bert Garcia had been talking with Canetti for the past six to eight months about hosting a Dash game in Edinburg. “Houston is our second home, and for us to be able to lend our house to them is a no-brainer,” Garcia said. Garcia, also president of the RGV Vipers, said the organization aspires to bring a top-division pro sports team to the Rio Grande Valley. Garcia believes soccer is the best path to realizing that goal, given the love of the sport in the area and the affordability of tickets. Garcia said he also believes the 10-team NWSL is open to expansion. “Maybe if the fans come and support it not only for this game, is this something that in the future we may be able to apply for a franchise?” Garcia said. The more immediate challenge is ensuring turnout at H-E-B Park on Wednesday. According to Soccer Stadium Digest, the Toros have averaged 6,989 announced attendance at H-E-B Park this year, and the Dash have averaged 4,533 per match at BBVA Compass Stadium. Garcia said part of the organization’s promotion of the match has included reaching out to many of the girls sports teams from area high schools and travel programs. Canetti said a successful event Wednesday could lead to more Dash games at H-E-B Park in the future. Vera is doing her part to help fill the stands, exchanging her unused tickets from previous matches for seats to Wednesday’s game. North Carolina is the league’s No. 1 team and defending champion, while Houston sits in eighth place, already assured of missing the playoffs. Still, Vera said the NWSL almost always produces competitive matches, with the Courage clipping the Dash 1-0 when the two teams met Sept. 9. Vera also pointed to the lack of flopping and individual star power as major selling points of the game. The Dash roster includes Carli Lloyd, the 2015 and 2016 FIFA Player of the Year who was a part of the United States winning a pair of Olympic gold medals the most recent World Cup, though an ankle injury may keep her out of action on Wednesday.